If you’re starting a search for a 1-bedroom apartment in Littleton, Summit Riverside might just be the ideal location–particularly if you’re looking for an apartment with loft space. Our Eagle floor plan gives you almost 900 square feet of space that includes a 1-bedroom, a full bathroom, and a loft. This makes for a space that’s roomy enough to enjoy to its fullest, but cozy enough to be able to relax in. The luxury apartments at Summit Riverside are designed with large closets, central air, washer and dryer units, wood fireplaces, and stainless steel appliances, ensuring that however you choose to decorate, your place will look great. 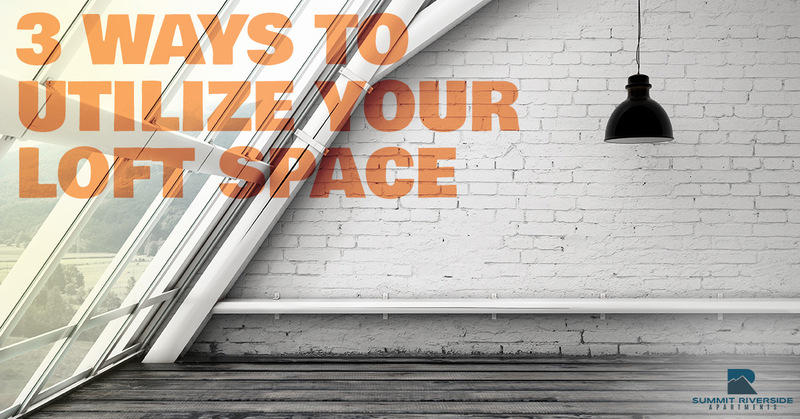 But how can you take advantage of that loft space and use it to its fullest potential? We have a few suggestions for you, so keep reading to find out. Who doesn’t love to kick back and relax with a video game from time to time? Your loft space is ideal for this very application! Whether you kept all of the old systems you had from your childhood (or purchased the new versions like the NES or Super NES Classic) or you’re a big fan or the newer gaming systems, setting up a dedicated space with a television is a great way to take advantage of a bit of extra space. Of course you could also just set up a few chairs and coffee table to play board games on as well. Everyone deserves to have a place where they can go to enjoy some peace and quiet within their living space. Let’s be honest here–we could all stand to do a bit more reading. Bring in a cozy couch or chair, set up a side table, and add a good lamp. That’s all you need to create a comfortable nook to do a bit of reading. It doesn’t matter what you’re reading either, because it’s ideal to do it in a location that’s not filled with noise. So break out the Stephen King novels and spend an evening getting lost in a good book. If you’re a movie buff, you probably want to have a space that’s dedicated to your entertainment center. Whether you prefer classics from the Criterion Collection, you’re working your way through watching all of the Best Picture winners, or you simply want to catch up on the flicks from the Marvel Cinematic Universe before the new Avengers movie comes out in a couple of months, you’ll be thankful to have a cozy place to settle in and watch a movie or two. Looking for Apartments in Littleton? Whatever you decide to do with your loft space, you can count on Summit Riverside Apartments in Littleton to provide you with the living space you’ve always dreamed about having. With plenty of great amenities and close proximity to some of the best restaurants, coffee shops, and entertainment in the area, you’re sure to love living at Summit Riverside. Interested in living here? Request a tour today to see what you think for yourself.